I wanted you to see the last part of the Throwback Collection that I have just revised. For the record I will clearly state that transhumanization is the goal. 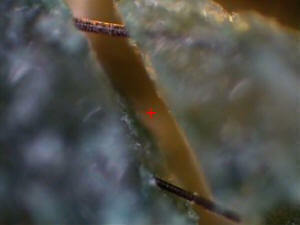 No one component that is identified in Morgellons Disease is going to be a full answer. I have hesitated to talk about the transhumanism because some people are still stuck on even believing that we have a real disease. I guess it is time I made my position clear. Last part of the "Throwback Collection"
Along with that we have the presence of Beta-1,3-Glucans from the oomycota varieties which are known for their anti-tumor effects and beneficial effects on the immune system. How nice of them to throw out a health bonus. As I have just mentioned it is also known for it's ability to produce an environment for the development of nano machines and bio-engineering. Take a look at my photo journal and see the many categories of wires and components inhabiting the human body. This is not random. Consider the implications of the bigger picture and the fact that most people without symptoms have had the same exposure to the same chemtrails and tainted food as Morgellons victims. These people may simply be assimilating the technology without problems or symptoms. Morgellons disease may actually be the lack of ability to assimilate the crap they are dumping on us due to an aberration in our immune systems or our genetics. This aberration was probably unforeseen by those who are doing this to us. As such it is an unwelcome circumstance that is being ignored, ridiculed and constantly monitored by professionals. Reality is not always apparent until it is in hindsight. Further, all "people" we meet are not necessarily what they appear to be. This is not a one-component disease but a system of synergistic pathogens with a purpose. As an update, I want the public to understand that there is no valid funded research being done by our government. A handful of people are trying to make progress with their own time and money but it seems that there is a brick wall placed in front of us at every turn. I believe the term for this is that we are being "contained". A number of medical professionals have found that involvement with the Morgellons issue has led to government shakedowns of their records in attempts to find any reason to close them down. Other researchers have been threatened and more. There is a dark underbelly of evil that is calling the shots regarding this man-made disease. It is time to wake up and discern the truth. In the first three years I suffered with Morgellons disease I was totally on my own. All I knew was that I had something on and in my body that I could see and feel but my doctors were trying to tell me I was having delusions of parasites. They also told me the ulcerous sores on my body were the results of self excoriation. I made all of the classic moves like bringing in fibers to show the them. The humiliating treatment I received from the medical profession only succeeded in making me very angry and fueled my great determination to prove them wrong. I thought that I was the only person going through this misery and didn't learn for several years that other had these same symptoms. In the beginning I was looking for something with a logical and biological explanation. I was not into any sort of conspiracy theories. I simply thought I would get a microscope and study what was on my body. I believed that with enough studying and looking through the scope that I would identify what disease I had from a known database of recognized diseases. I began a 3 year study of all fungus, cyanobacteria, chytrids, rotifirs, algae or anything else I could learn about that might be a clue to this mystery. During the time I worked with Mary she was able to get some of my Morgellons samples into a lab at the University of Pittsburgh. They underwent testing using Fourier Transform Infrared Spectroscopy. They were found to be hollow, auto fluorescent and to contain cellulose but no chitin. From my earlier study of mycology I knew that the absence chitin ruled out any fungus since all fungus contains chitin. 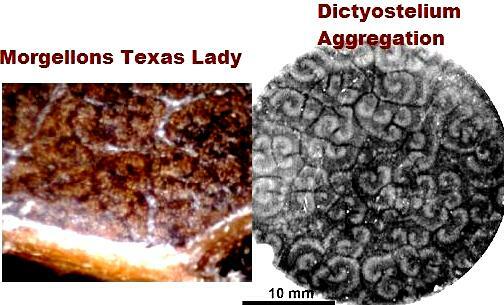 At that time I got a letter from Mary and with some micrograph images taken by the lab. Due to a computer assault from an evil anti-Morgellons website I no longer have copies of these. Apparently the samples were quite a sensation at the lab and could not be readily identified. There were to be further studies done and frozen cross sections for further testing had already prepared by the lab. Shortly thereafter I learned that the University had told Mary they had no time to work on it. This was surprising since it was a unique material with many unanswered questions and this was, after all, a University where I would hope knowledge would be valued. I began to wonder why the Morgellons research had been dumped like a hot potato. Several years later more fiber samples from my body were determined to be made of HDPE ( high-density polyethylene) by another researcher who paid to have them tested at several accredited labs. There are differences in the fibers since some are round and some are more ribbon-shaped. There may also be a difference if a fiber directly enters the body from the environment or if it is a second or more generation product of self replication that occurs in the body. 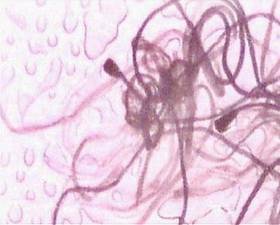 In later years it was apparent to me that the bizarre nature of my Morgellons findings were unnatural and likely from a man-made source. It was not a pleasant journey as I began to "wake up" to what was happening in this altered reality. Much to my dismay, all roads carried me to the same conclusion and still do. The pathogens in my body came from a bio-lab and have the hand of man written all over them. It occurred to me that if these pathogens were being bioengineered in a lab that they were made of multiple components and that the mutated material might reproduce and intermittently send out a batch of identifiable debris much like the original genetics. I call this type of debris �throwbacks� (http://www.morgellonsexposed.com/Throwback.htm). The multi-component part of my theory has proven to be true. "Revelations From a Man Who Helped Design Morgellons Disease"
It is my theory that when new life forms or designer diseases are created in bio-labs using the processes of gene splicing, mutation, bioengineering or nanotechnology that components of these mixtures can self replicate with varied results. Components such as dictyolstelium discoidium, insect genes, and other pathogens will continue to make some new mutations in each generation of self replication. I believe that some of these mutations "throw back" to expressions similar to the original materials used in the lab created mixture. 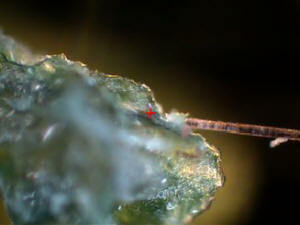 Specimens from Morgellons disease tissue can sometimes be identified as nearly identical to the original components used in this biological witches brew before the mutation process. It is not unlike finding a child with flaming red hair in a family of people who do not have this characteristic. Hopefully the previous ancestral hair colors of past generations were known to the parents since situations like this can lead to being a guest on The Maury Povich (Who my Baby Daddy?) DNA Testing Show. If only gene identification for Morgellons disease was this easy. The information in this paper is only my personal theory but it is the best explanation I can find to make sense of all of the strange artifacts that come from people with Morgellons disease. It is also why I think that some of these strange findings occur most frequently in the early phases of the disease and do not repeat as often in later years of the disease. I will later discuss a strange cellular slime mold known as dictyostelium discoidium. It is all about using the genetic characteristics of this cellular slime mold to produce mutations in a bio-lab. I believe it is one of many parts of the Morgellons story. Most of my �throwback� findings only appeared in the beginning of the disease when I had multiple lesions and things were at their worst. That was about 7 years ago. I had tentatively identified some of the debris as members of 3 varieties of the Oomycota phylum of pseudo fungus. There are over 500 varieties and many of them can have ill effects of humans, animals and plants. The varieties of oomycota can produce diseases like pythiosis, lagenidosis, rhinosporidosis, downy mildew, blue tobacco mold, the fish disease saprolegnia (Ich) and the infamous phytophthora infestans that had killed millions in the Irish Potato Famine by blighting the spuds. I had also found bizarre mutations of earthworms and other material that looked like dictyostelium discoidium. 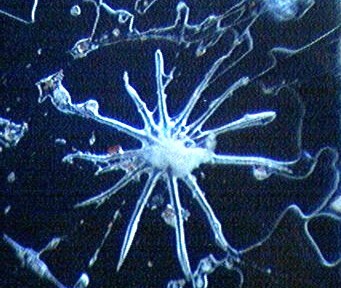 The reason that the dictyostelium discoidium is important is because this cellular slime mold has unique properties that lend itself to mutating other substances. 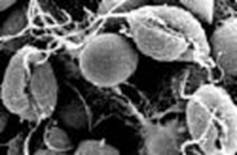 These eukaryotic microorganisms have a simplistic genetic makeup and produces what are know as chemotaxis. 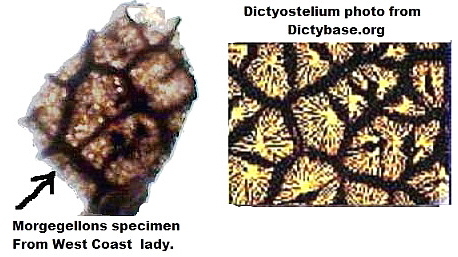 Dictyostelium is utilized in many labs to specifically mutate other material. Dictyostelium has an amoeba form along with many other stages of varied shapes and configurations as the individual cells emerge into groupings that look like larger single entities. 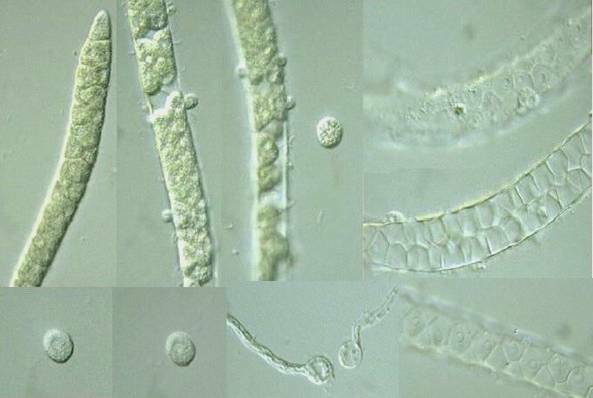 �Dictyostelium amoebae grow as separate, independent cells but interact to form multicellular structures when challenged by adverse conditions such as starvation. Up to 100,000 cells signal each other by releasing the chemoattractant cAMP and aggregate together by chemotaxis to form a mound that is surrounded by an extracellular matrix. Processes depend on cell-cell communication in Dictyostelium. Many of the underlying molecular and cellular processes appear to have arisen in primitive precursor cells and to have remained fundamentally unchanged throughout evolution. Basic processes of development such as differential cell sorting, pattern formation, stimulus-induced gene expression, and cell-type regulation are common to Dictyostelium. It is used in gene research as well as other uses� (dictybase.org). To watch these little amoeba squirm and aggregate watch video here: http://dictybase.org/Multimedia/development/agg.mpg. It may have an eerie familiarity to Morgellons victims. Each shape is comprised of hundreds to thousands of single motile amoeba cells acting in unison to form each of these configurations. Take a good look at the photos below. There is a definite presence of Dictyostelium in the tissue from Morgellons victims. This can only mean that our disease is man made in a bio-lab. The pathogens we have are no doubt a mixture of the Dictyostelium and other pathogens that were purposely mutated with it for a deliberate purpose. From: "Texas Medical Center News"
development, Dr. Kuspa can determine the gene's function. It takes only a month to generate a mutation in Dictyostelium, but in a more complicated genome, such as that of a mouse, the process can require six months to a year. "We have developed methods that enable one laboratory researcher to mutate 100 Dictyostelium genes within a month," Dr. Kuspa says." 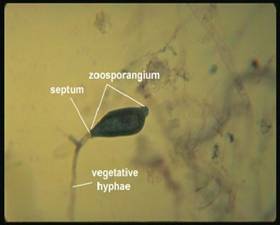 Here are some of the �throwbacks� I found in my own tissue from the phylum oomycota (o-o-my-CO-ta) 3 photos of saprolegnia zoosporangium. These are not the original coloration as shown except for small image on lower left fibers were dark blue, bulbs on the ends of fibers were brown/red. 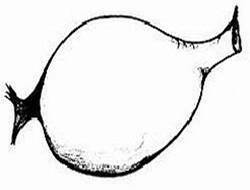 The bulbs (zoosporangium) would fall off as a separate component. I only found this formation twice, about 5 years ago. The photo below is not from my body but I did find a specimen exactly like this. I was able to get a drop of the clear sticky liquid that came out of a lesion onto a slide. At a magnification of 350x I found a tiny but uniquely distinct shape on the slide. 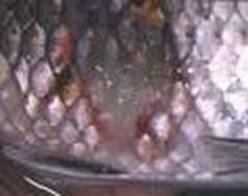 I could not then identify it but I described it to Mary Leitao as a clear snake skin with tiny round circles in it. I was sure this slide would be a breakthrough for the research but unfortunately that did not happen. I did not have a microscope that I could take a digital image with at that time. I did have a scientific microscope. I sent this slide to Mary Leitao who is a trained biologist. She looked at it and acknowledged the specimen on the slide. She forwarded that slide and many others to Dr. William Harvey who was then in private practice. The slides were said to have been �lost� during a move by his office. Formerly Dr. Harvey had worked for NASA full time and at that time was still the Chairman of their Educational Advisory Board. I must admit that I still question what happened to my slides. I later identified the missing specimen as Dictyuchus from a web photo. All of the varieties of oomycota I have mentioned thus far are related to the fish disease known as Ich or Saprolegnia. I do not believe that Morgellons victims have a pure strain of this disease but I do believe that some of the genetics were used from this disease in the bioengineered mixture. Top photo: Oomycota Peronospora Tabacina or blue tobacco mold. 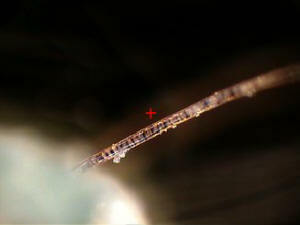 Photo from " Blue" Morgellons victim. This is the last of the oomycota from my body. I have found a few of these grooved, coffee bean shaped pieces in the past but this one was found only a few weeks ago. 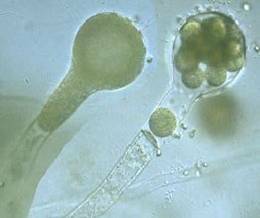 This zoospore is Phytophthora infestans, the villain in the Irish potato famine. This is a motile zoospore powered by two flagellum. 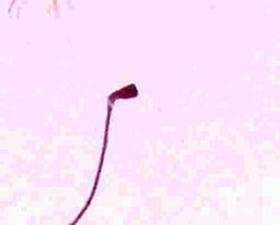 One is a long whiplash flagella and a shorter one is the shorter tinsel flagella. When these zoospores are threatened they encyst and can hide out in their encapsulated form for a very long while. 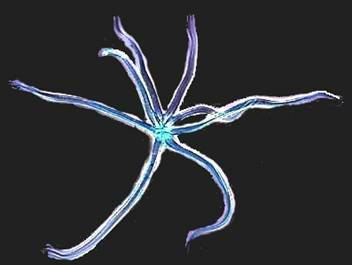 Sometimes they release the flagellum and in other instances they retract the flagellum and they become encysted as well. 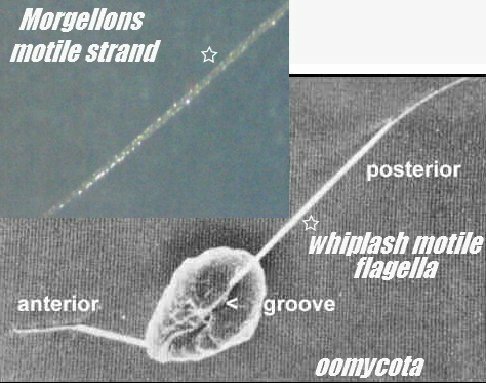 The whiplash flagella has a shape similar to a worm-like structure I often find which I call the motile strand. The composition of oomycota is cellulose and glucans which store mycolaminarin and is a form of sugar. If glucans and cellulose are added to the human body could the results of this addition = excess sugars and carbohydrates = diabetes? I wonder since I have recently been diagnosed with it and there is an epidemic of it in this country. I will search for answers and write a follow up. 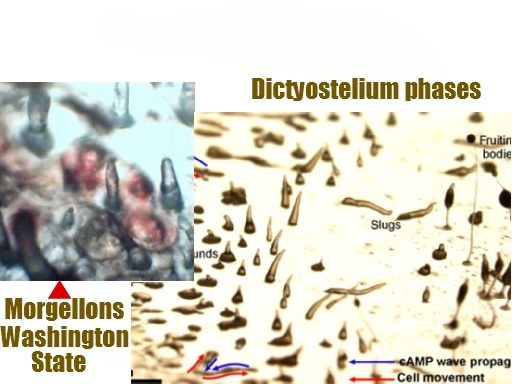 Web photos of phytophthora infestans compared to Morgellons motile strand. This is what I found in a lesion on my body. Phytophthora_infestans: Potato blight was one of more than 17 agents that the United States researched as potential biological weapons before the nation suspended its biological weapons program. France, Canada, USA and the Soviet Union also researched P. infestans as a biological weapon in the 1940s and 50s. Do we really believe that this former candidate as a biological weapon was discontinued by the Government? What a coincidence that it is turning up in the tissue of Morgellons victims. What I do know thus far is that some of the motile (moving) strands found on my body were tested with Raman Spectroscopy in the labs at SUNY Stony Brook. 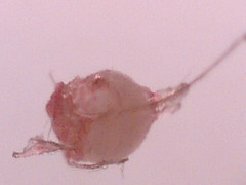 The results were surprising to me at the time since I expected the fibers to be silicon or HDPE (high density polyethylene) due to previous results of other types of Morgellons samples that had undergone professional lab analysis. These strands were made of an indeterminate kind of polysaccharide (sugar substance- polymer and other unknowns). More testing was to be done on this material but this was not possible since the researcher, quite suddenly, was no longer allowed to use their lab. Funny how any progress on Morgellons research seems to end suddenly as soon as the research results are posted on the Internet. 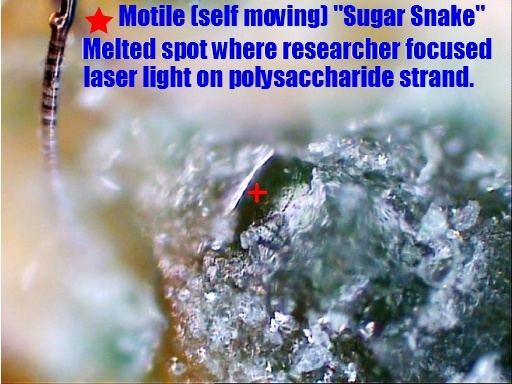 I wondered how many sugar/polysaccharide based organisms could produce motile strands with independent movement. Once again I could only think of the zoospores of the polysaccharide based oomycota and the whiplash flagella of pythium insidiosum. 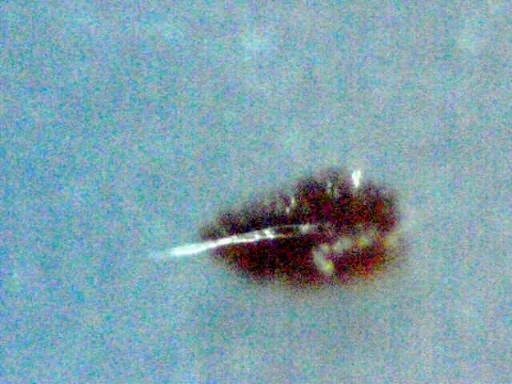 There are some chytrids that produce motile zoospores but not in long stranded fibers. All roads lead me back to my original conclusion of oomycota. There are 7 pages of his lab photos at this site. The question I have now is are the materials in these strands related to the beta glucans in the oomycota? The cellulosic compounds and Beta-1,3-Glucans in oomycota form a natural polymer in it's original state. In this bioengineered state what is the purpose of the material as it is being introduced to our bodies through many vectors? The answers are rapidly coming into focus. After further research I have determined that the specific strains of oomycota that I have found in my body all contain soluble Beta-1,3-Glucans. This is an important new discovery since out of the 500 species of oomycota only a small percentage contain this Beta-1,3-Glucans characteristic. All of the oomycota species I identified as throwbacks have this Beta-1,3-Glucans in their makeup. At the original time I did the oomycota research which started 5 years ago there was no immediate connection I could even imagine to link my oomycota samples to biotechnology or nanotechnology. I had not yet found the other nanotechnology items that surfaced in my body which I have since identified. Read "Living With a Nightmare" for more information. It has only been lately that I revisited the past and decided to see if there was somehow a nano or bio lab connection with my earlier finds. I identified them 5 years ago with no thought in mind to ever match them to any data. The odds against finding these particular oomycota specimens and making a meaningful match for them is astronomical. The article below regarding the surprising characteristics of Beta-1-3 glucans was a fortuitous find in my recent research. "A soluble Beta-1,3-Glucan Found in Selected Genera of Oomycetes"
�The polysaccharide extracted from each organism was water soluble and had an infrared spectrum very similar to the glucan of Phytophthora and Achlya. The infrared spectra of the glucans of Phytophthora, Saprolegnia, Dictyuchus and Pythium are identical." Now that I have established the probable presence of the Beta-1,3-Glucans by way of oomycota in Morgellons victims, the following article which I recently found is not a coincidence. The law of averages ran out a long time ago for this to be coincidental. 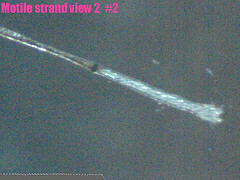 I believe we are looking at a huge puzzle piece in the Morgellons mystery. What could oomycota possibly have to do with biotechnology or nanotechnology? Please read the following article. "Beta-1,3-glucan polysaccharides as novel one-dimensional hosts for DNA/RNA, conjugated polymers and nanoparticles." Department of Chemical Processes and Environments, Faculty of Environmental Engineering, The University of Kitakyushu, Hibikino, 1-1 Wakamatsu-ku, Kitakyushu, Fukuoka, 808-0135, Japan. Beta-1,3-glucan polysaccharides have triple-stranded helical structures whose sense and pitch are comparable to those of polynucleotides. We recently revealed that the beta-1,3-glucans could interact with certain polynucleotides to form triple-stranded and helical macromolecular complexes consisting of two polysaccharide-strands and one polynucleotide-strand. This unique property of the beta-1,3-glucans has made it possible to utilize these polysaccharides as potential carriers for various functional polynucleotides. In particular, cell-uptake efficiency of the resultant polysaccharide/polynucleotide complexes was remarkably enhanced when functional groups recognized in a biological system were introduced as pendent groups. The beta-1,3-glucans can also interact with various one-dimensional architectures, such as single-walled carbon nanotubes, to produce unique nanocomposites, in which the single-walled carbon nanotubes are entrapped within the helical superstructure of beta-1,3-glucans. Various conductive polymers and gold nanoparticles are also entrapped within the helical superstructure in a similar manner. In addition, diacetylene monomers entrapped within the helical superstructure can be photo-polymerized to afford the corresponding poly(diacetylene)-nanofibers with a uniform diameter. These findings indicate that the beta-1,3-glucans are very attractive and useful materials not only in biotechnology but also in nanotechnology. These unique properties of the beta-1,3-glucans undoubtedly originate from their inherent, very strong helix-forming character which has never been observed for other polysaccharides. Note: The number 3 in Beta-1,3 glucans indicates 3 carbon atoms. The next articles is also about the use of sugars with 3 carbon atoms. Here are some odd finds I made a few years back. I am only glad that I have not seen any of these recently. 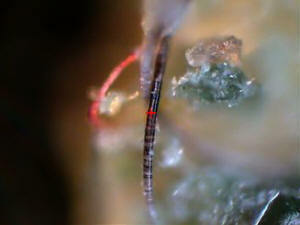 It is no surprise to me that people with Morgellons often find insect-like creatures in their lesions. I believe these throwbacks can be whatever genetics are part of the brew. It may vary in different people as to what they may find. It may be a function of their own genetics as to what manifests. Could these worm genes now be a part of the polysaccharide �Sugar Snake?� Here are more mutations to ponder. Which part is the worm and which is the polysaccharide? Some throwbacks can't make up their minds. 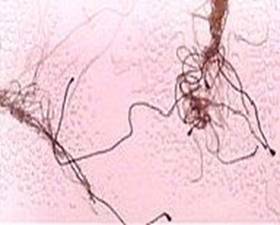 Many people with Morgellons disease have noted that they rarely get any bacterial or secondary infections in the lesions. 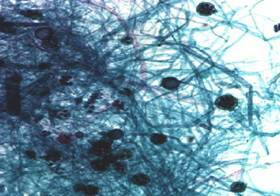 The dictyostelium are eukaryotic microorganisms that eat bacteria for lunch. (they also	produce ammonia). Normally there would not be enough bacteria on the human body to keep dictyostelium adequately supplied with it's fuel. 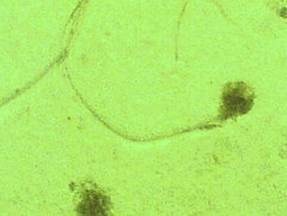 There have been findings in Morgellons victims by other researchers of mycoplasma and chlamydya pneumoniae which are both bacteria that are especially difficult to kill on the human body. Recent reports have come in from others with Morgellons disease who state that in clinical testing there is a nearly complete a lack of healthy bacteria in their intestines but there other harmful bacteria in their bodies. The need for probiotics and Diflucan or cellulose eating products that contain cellulase and hemicellulase like Candex or NSI Candida yeast Management Capsules becomes necessary. These types of products may be helpful for overgrowth of cellulose combined with the lack of beneficial bacterial flora in the body. This lack of beneficial bacterial flora would be further evidence of the dictyostelium feeding on the beneficial bacteria in the body. There is anecdotal evidence that that if sugars and carbohydrate consumption are lessened it may help to lessen the negative impact of lesions and symptoms. The pathogen that I believe many have is a mixture of oomycota and the dictyostelium. Just like Candida which has cellulose as a component the oomycota has cell walls of cellulose. The human body has no way to rid itself of cellulose. Feeding the body carbohydrates which will ultimately become sugar overgrowth due to lack of good bacteria in the gut, seems support this cellulose growth. To lessen the cellulose growth, carbohydrates are best kept to a minimum. Since I have had type 2 diabetes this past year and have had to alter my carbohydrate intake, my skin manifestations have lessened. Two other people I know have tried this and have had many of their skin symptoms abate. It is certainly not a cure but it may be helpful to know if skin symptoms are especially aggressive. Unfortunately the internal nano wiring and and other body symptoms have remained largely unchanged. Could it be that some symbiotic balance is being kept in the grand scheme of things to create a favorable environment for the dictyostelium, oomycota and other genetic bio-mixtures to live well and prosper? In the bigger picture most things found are serving a purpose and act together. These are not all random things thrown into the mix without thought or purpose. To find the answers, all of the components must be looked at as a whole system. Consider the implications of the bigger picture and the fact that most people without symptoms have had the same exposure to the same chemtrails and tainted food as Morgellons victims. These people may simply be assimilating the technology without problems or symptoms. Morgellons disease may actually be the lack of ability to assimilate the crap they are dumping on us due to an aberration in our immune systems or our genetics. This aberration was probably unforeseen by those who are doing this to us. As such it is an unwelcome circumstance that is being ignored, ridiculed and constantly monitored by professionals. Reality is not always apparent until it is in hindsight. Further, all "people" we meet are not necessarily what they appear to be. If all is as I suppose it to be considering what I see coming out of my own body on a daily basis, there would be a small army in place to contain the Morgellons information from the public. Morgellons is not a one-component disease but a system of synergistic pathogens with a purpose. As an update, I want the public to understand that there is no valid funded research being done by our government. A handful of people are trying to make progress with their own time and money but it seems that there is a brick wall placed in front of us at every turn. I believe the term for this is that we are being "contained". A number of medical professionals have found that involvement with the Morgellons issue has led to government shakedowns of their records in attempts to find any reason to close them down. Other researchers have been threatened and more. There is a dark underbelly of evil that is calling the shots regarding this man-made disease. It is time to wake up and discern the truth. Let's spread the truth and the love - they just hate that.